Rise and Shine, my friends… It’s time for breakfast in Disney Springs! What? 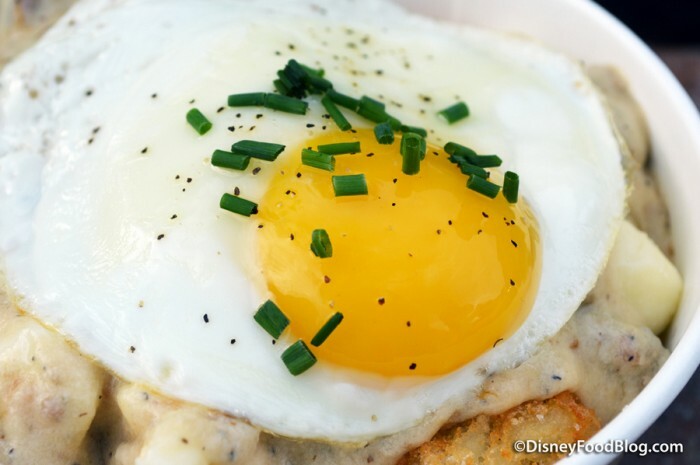 You don’t particularly think of Disney Springs as a breakfast destination? Granted, when I think of dining in Disney Springs, my mind immediately jumps to a lot of great spots to grab some dinner and take in some of the revitalized nighttime atmosphere in the area since its transformation from Downtown Disney. In fact, some spots like Morimoto Asia are even focusing on the night owls with menus dedicated specifically to Late Night Dining. But with all the new additions over the past year or so, Disney Springs is becoming a place where you really can spend a huge chunk of a day if you enjoy strolling around and shopping or taking in some of the outdoor entertainment. So guess who’s got you covered for some earlier-morning eats? Not exactly what you were expecting? I mean, what could a kiosk that focuses on the classic Canadian dish of Poutine (French Fries, beef Poutine gravy, and white cheddar cheese curds) possibly have to offer for breakfast? 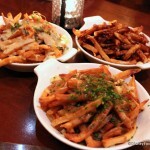 Well, let’s not forget… The Daily Poutine also serves three variations on the traditional version. 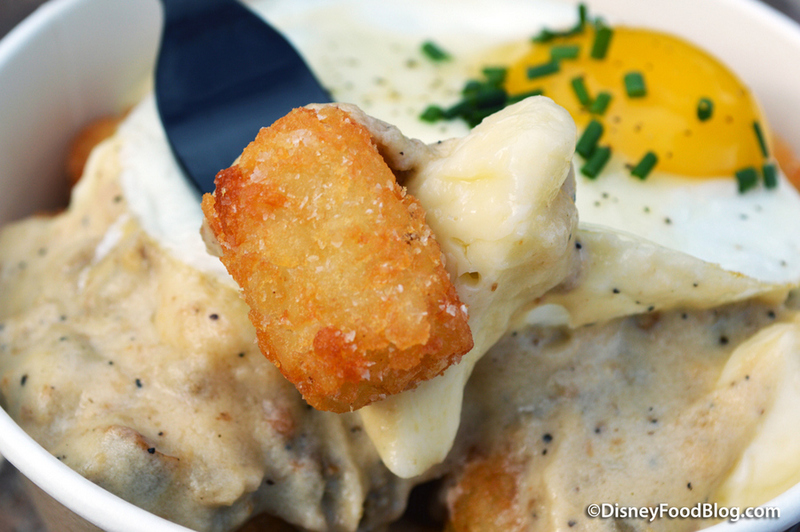 And to those, we can add one more: the new All-Day Breakfast Poutine! Yep, it’s served all day. So whether you’re on the hunt for Breakfast or Brinner in Disney Springs, you’re all set at The Daily Poutine. But instead of French Fries, the Breakfast Poutine is served with a base of Fried Potato Puffs (TOTS!!!) topped with Sausage Gravy, Cheddar Cheese Curds, and a Fried Egg. 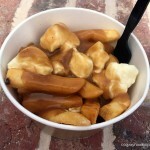 Pretty much the only thing it shares in common with the Classic Poutine is the inclusion of white cheddar cheese curds. Let’s start with the base — the Potato Puffs are well-seasoned with salt and also have a really nice crunch, especially when you consider all the gravy poured on top. I was happy to see plenty of each ingredient throughout the whole mix… including those cheese curds! 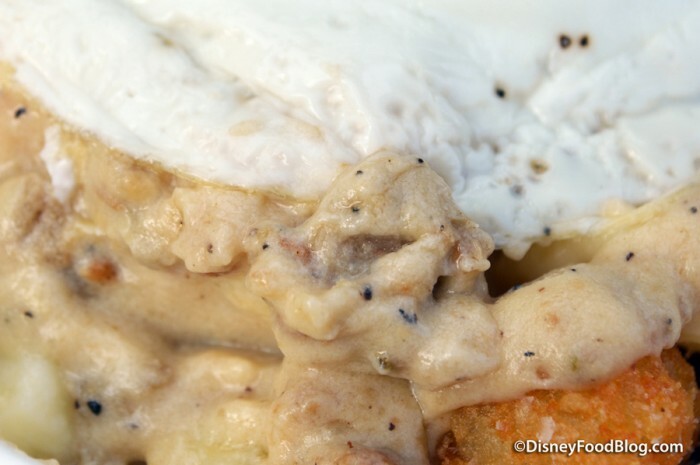 That Sausage Gravy, by the way, is packed with flavor thanks to plenty of black pepper and sausage pieces throughout. I was pleasantly surprised with how well-prepared my fried egg was, served a little on the runny side and topped with chives. But if you like your egg on the hard side, just say the word to the Cast Members who can cook the eggs a little more to meet preferences. Oh, and they also mentioned that you can sub out the Potato Puffs for French Fries if you want something closer to the Classic Poutine experience… only with a start-of-the-day twist. Now, I may be biased because I could eat breakfast foods all day, every day. But this was just seriously awesome. A nice amount of flavorful food, and another fun variation on the original! 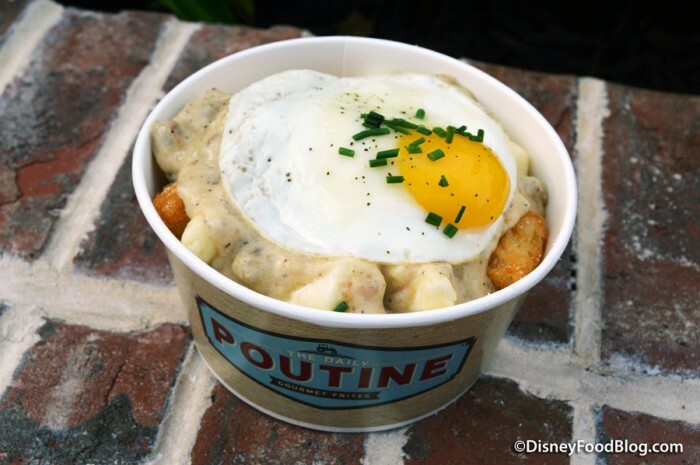 So, remember, you can now add The Daily Poutine to the list of places you can find some breakfast in Disney Springs — a list that already includes spots like Earl of Sandwich, Erin McKenna’s Bakery NYC (try the Donuts!! ), the West Side Starbucks (with a smaller array of items at the Marketplace Starbucks as well), and Wolfgang Puck Express (Marketplace). Note that opening times of these spots can vary, with some opening as early as 9:00 am and others around 10:00 am. 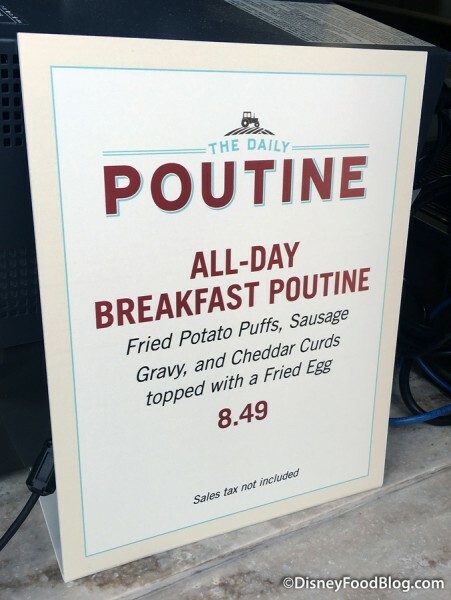 (It looks like, in the opening days for this dish, The Daily Poutine has been opening at 9:00 am instead of its typical 10:00 am to see how things go). So there’s no need to go without the Most Important Meal of the Day in Disney Springs… no matter what time you start it 😉 . Do you have a favorite spot for breakfast in Disney Springs? Please let us know with a comment! 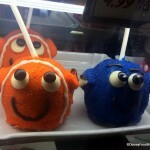 « Rumor: Sprinkles Coming to Disneyland’s Downtown Disney? However, just don’t se a scenario where I would find myself in DTown Disney in the AM…. Maybe on the last day of trip….. This is the most disgusting breakfast I ever saw. On our vacation in mid August my son and I went to Disney Springs at about 10:45 am, a lot of places were not open yet or just opening. I was shocked! I would not plan on going to Disney Springs for breakfast because half of the place is closed! We started at the other end by the bowling lanes, then worked our way over to that end, which according to your article seems to be awake a little earlier! My husband would love this as it has all his favorites in a cup together, although my son isn’t having anything to do with eggs that aren’t scrambled and uniformly yellow. May have to make a stop on our upcoming trip the morning we leave; breakfast for the road! AJ —-Could you please tell me why Disney has taken off all the menus for all their dining locations on their website ??? When planning our meals for our vacation, viewing the menus was half the fun !!! Elizabeth — We noticed that today as well! We aren’t sure — we are thinking they’re just updating. In the meantime, we’ve had success Googling the menu we wanted to look at directly, and they are also still accessible on the My Disney Experience App. Thanks for sharing this, I’ll definitely be grabbing some for brinner tomorrow!! I’ve never been to DTD for breakfast, it this could always change. I think I would be lured to EoS, but I may be adventurous! Thank you for the info Brooke !!! Essie — If you venture to Disney Springs on the weekend, Raglan Road has an incredible brunch, too! Thank you again Brooke ! I look forward to seeing the menus !!! Thanks for this and mentioning the places in DS that are now offering breakfast. My DD has a BBB appt at 10:30 in a couple of weeks. Think we’ll venture to DS early and enjoy breakfast there which will be a nice change from the resort breakfast. My opinion is that breakfast is still the meal that is hardest to find in a QS location outside of the resorts. 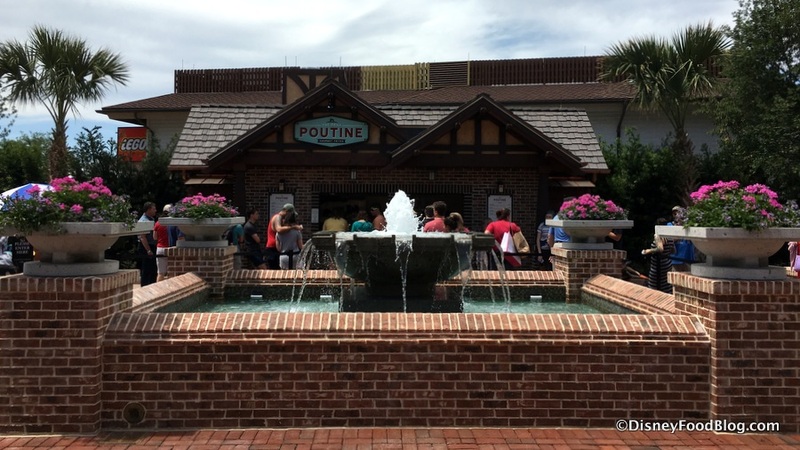 When my husband and I went to DIsney Springs to have breakfast at the Daily Poutine ,we were dismayed to find that it didn’t open until 11, so we went to the Coca Cola store to look around (if you need ANYTHING with the Coke logo on it, check it out !) and then went back to DP . The Poutine was delicious and I’m happy to see that it is open earlier ! Also, it really should have a sign with operating hours. Didn’t know how long to hang around. Mike V, August 31, 2016 at 7:33 am, said he couldn’t envision a scenario where he would be in Disney Springs in the morning except possibly the last day of his trip. On the contrary, we live in South Florida and have always made it a point to be on the road by 5 AM so we could make the 3-3.5 hour drive, get to our desired park, actually, park and be waiting in line when the gates open. Nowadays, with all the additions that have been made to ;Disney Springs (although we still call it Downtown Disney among ourselves) we make a full day of Disney Springs just like any of the parks. We’re able to get on the road around 6-7AM, pick up breakfast at a drive-thru and eat on the road, arriving comfortably at Disney Springs around the time the shops are all opening. Then we spend Day2 in a park, usually Epcot, arriving fully refreshed to enter the park when it opens. We usually spend our last day shopping at a couple Disney outlet stores and returning home either immediately after dinner or in time for dinner at home. Since we’re not controlled by flight schedules either in or out, it makes for a more relaxing trip, knowing we can always spend an extra day or go home a day early, as we please. 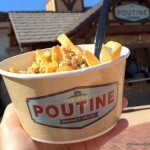 Whatever else we do next trip, I GOTTA have one of those breakfast Poutines! 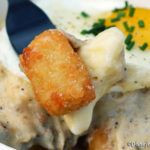 I LOVE potato puffs and eggs, sausage gravy just makes them better, and I’m looking forward to trying cheese curds.